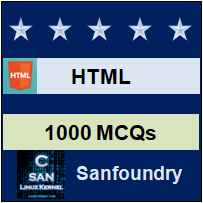 This set of HTML Multiple Choice Questions & Answers (MCQs) focuses on “Choosing Web Servers”. 1. Which of the following is not a web server? Explanation: Tornado is a web server written in python language. Eclipse is a web server (Java HTTP server). Apache Tomcat, is a web server which is also known as Tomcat server. BlueGriffon is an IDE. 2. Tomcat is an open source web server that provides a servlet container allowing you to run Java code. Explanation: Apache Tomcat, a web server developed by the Apache Software Foundation and which is also known as Tomcat Server. Apache Tomcat provides several Java EE specifications such as Java Servlet, JavaServer Pages (JSP), Java EL, and WebSocket. It also provides “Java” HTTP web server which is used to run java code. 3. Which of the following interface is not supported by LightTPD? Explanation: Interfaces like FastCGI, SCGI and CGI are supported by LightTPD to external programs to be used with the server. 4. Which of the following is not a prepackaged server stack? Explanation: Collection of software that forms operational infrastructure is a server stack. WampServer refers to a software stack.XAMPP is prepackaged stack developed by Apache Friends. To run dynamic web sites on computers, a solution stack known as MAMP is used. There is nothing like NAMP. 5. Which of the following is not a channel of mozilla? Explanation: Mozilla Foundation & Corporation developed a open source web browser named Mozilla Firefox. Later on, new version of mozilla arrived in market, which are named as Firefox Beta & Firefox Aurora respectively. Firefox alpha is not a channel of mozilla. 6. Google Chrome has its own task manager, which allows you to view and manage your memory and CPU usage. Explanation: A task manager provides many functions to us including, managing applications, handling running pc, providing informative statistics, enabling computer on or off, etc. Google Chrome also has a task manager, which allows you to view and manage your memory and CPU usage. 7. Which of the following are automatically loaded and operates as a part of browser? Explanation: Functionality of firefox can be extended as well as modified by using Add-ons. Plugin programs operates as a part of browser. A utility provides an addition to the capabilities provided by the operating system. A widget is a simple application extension that is already installed on the device. 8. Which of the following allows user to view a webpage? Explanation: The Document Object Model is a cross-platform and language-independent application programming interface that treats an HTML, XHTML, or XML document as a tree structure. A document can be viewed as a logical tree with help of DOM Model. Explanation: X-UA-Compatible is a document mode meta tag that allows web authors to choose what version of Internet Explorer the page should be rendered as. The <meta http-equiv=”X-UA-Compatible” content=”IE=8″> display as IE 8 with or without a DOCTYPE. It provides fallback for IE8.